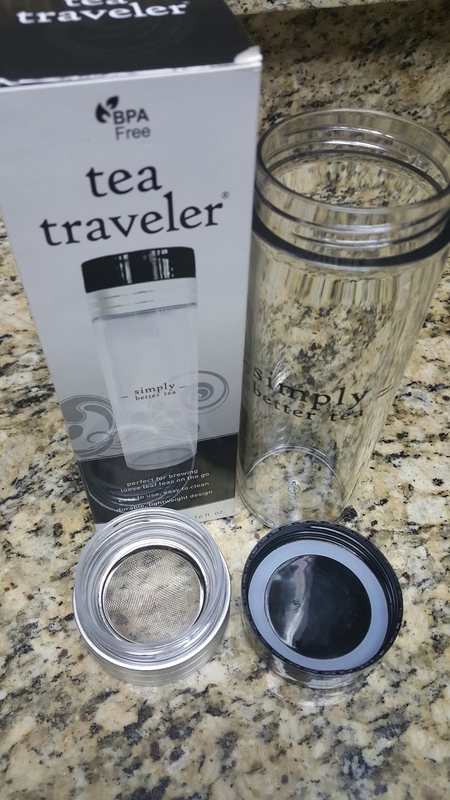 I got excited about the Simply tumbler, as soon as I saw it, because it made me think of how much I loved my Adagio tumbler. But, this is SO much better! 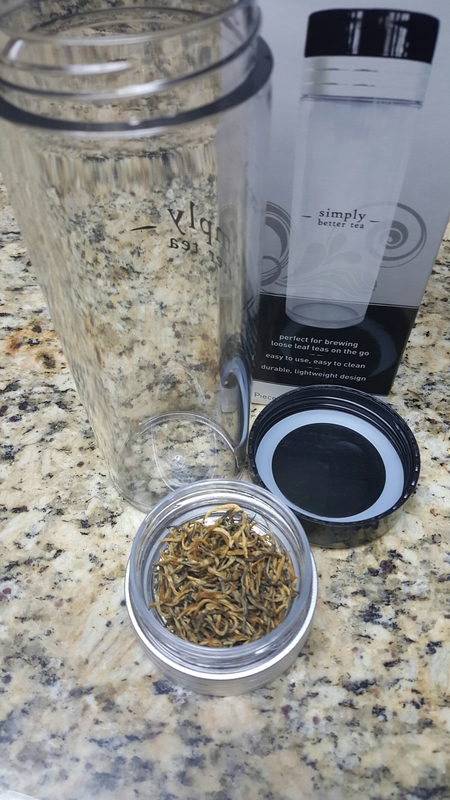 This tumbler holds more (16 oz) and has that same three piece structure. Now, that Adagio tumbler was made to be turned over onto the lid to steep and this one isn’t. But…I’m kind of a rebel, that way. I washed out the tumbler and then put in my tea. I prefer to sit my tea on the infuser basket, a trick that the Adagio tumbler taught me. I like this because I can control my steep time (by turning it over) and I have a place to sit my tea while it isn’t steeping (in between the infuser and the lid!). It’s perfect! The plastic ring in the lid isn’t deeply seated in, making it easier to remove and put back in than the others. One drawback, if you consider it one, is that the tumbler is not made of glass. If you like pretty things, this might be a LITTLE off the mark for you. But, I still think it looks great and (being a total spaz) appreciate the harder to kill material. All in all, the infuser was the deal sealer for me. I LOVE having that middle piece!! And yes, I turn it over to steep it (it’s a leak proof system). If you’re going to do so, know that it is against the recommendations and the lid isn’t flat. I just held it upside down while I wandered around, shopping. But, you can probably fit it in your cupholder upside down or find something to lean it against, just so that the water covers the infuser long enough to steep! Then, just turn it over and let it cool a bit. The tea will drip through the infuser and into the tumbler. Remember that, if you like your tea piping hot, the lid might spit a LITTLE when you release it to drink. I like to let mine cool a bit. It’s usually fine, either way. And here is where you can get the tumbler!